Last week, my baby step was to try my hand at soaking grains. Of course we all know that while I have good intentions, my follow through lacks on occasion (especially given the super busy time of year). I did do a bunch of reading on the reason behind soaking grains and I found a couple recipes that I wanted to try. Last night I set to work getting my prep work done for soaked whole wheat pancakes and soaked whole wheat bread. For the pancakes I used this recipe from Kitchen Stewardship. I was a little skeptical this morning when I thought the concoction smelled funny, but they tasted awesome. This recipe made 21 pancakes approximately 4" across. Next time I will make mini pancakes and let the kids dip (I think they eat more when dipping than forking). Each of the kids ate 2 (and Little Man ate 4), but there were still 7 left to freeze for a morning when we're rushed. Gotta love that. I also made whole wheat bread. I had picked out another Kitchen Stewardship recipe to try, but abandoned that idea last night in favor of using my own whole wheat bread recipe. I used the principles that Katie (from Kitchen Stewardship) laid out when making her own bread and applied them to my recipe. Basically, add all your wet ingredients (making sure that there is a somewhat acidic liquid) to the flour and then add yeast and salt the next day. I used 1/4 cup lemon juice as part of my warm water and used 6 cups of flour. This morning, I wondered how I was going to get the yeast incorporated into the bread and activated since my kitchen was a cool 61 degrees. I activated the yeast in a 1/4 cup of warm water and dumped it on top of the pile of goopy, soaked dough with the salt. I mixed it in as well as I could (which didn't seem to be near enough). Once again, it was covered and I placed it on top of my stove with the oven preheating-I hoped that the stove top would get warm enough that the dough would rise. An hour later, the dough had risen some, but not much. I was about to consider the whole thing a failure and dump the bowl. I decided that since I'd already used 6 cups of flour, another cup wouldn't be that more to waste. I dumped the dough out on my counter and kneaded another 3/4 cup of flour into the dough, placed the dough in bread pans, covered and waited for the second rise-again on the stove top. The rise was much better this time. I let it rise for an hour before baking and it came out of the oven looking like any other loaf of bread I've baked. At this point I was getting a bit more enthusiastic. Once cool, I cut a mini loaf for the kids' peanut butter and honey sandwiches. I did thin slices (think cocktail bread) and it didn't crumb very much at all. The crust was tender and the bread was soft, but not doughy. The taste is a tad on the sweet side, which was fine for pb & h, but I'll probably want to measure the molasses next time I make a loaf-this time I just eyeballed it and probably got a little too much. Overall, I've been impressed with my soaking efforts. Assuming the mini pancakes turn out as good as the larger ones (and I can't see why they wouldn't), this will be make go-to pancake recipe. I'll tinker with the sweetener in the bread (like actually measure) and see if I still like the bread as well, but I think soaking helped the texture of the bread and made it better for sandwiches. If I find this to be the case, it will be my top bread recipe. I didn't get around to making my steel cut oats. Maybe that will be breakfast tomorrow-we'll see. In an attempt to get out of my some 'ole recipe slump, I've started going through my recipe binders and few remaining cookbooks (in a big de-clutter last year, most didn't make the cut). Several years ago, my mother-in-law made a family cookbook for each family for Christmas. This recipe was submitted by Hubby's Aunt Marlene. It looked good and I thought Little Man might like it-he's going through quite the picky phase right now. Anyway, it was ready in a jiffy and the kids liked it. Little Man ate most of his serving. I thought it was good, but next time I'll add cheddar cheese. Cheese makes everything better. Note: The original recipe called for a can of cream of mushroom soup, but since I don't use that, I just incorporated making my own soup into the directions for the meal. A couple weeks ago, my "baby step" was to try new produce. Leeks were at the top of my list because it seems that all of the cool cooking shows or fancy food magazines have recipes using leeks. And we all know that I'm secretly striving to be like Paula Deen. NOT! I really just think they are cool looking and wondered what they tasted like (and if I could get my family to try them). My organic leeks arrived last Friday in my Azure Standard order, and due to some unforeseen activities, I didn't get to make my soup until last night (Tuesday). I can't believe I waited so long. It was awesome (like both of my kids ate 4 bowls awesome)! Granted, in the past couple of weeks I've read about 40 different recipes for potato and leek soup and similar variations. I didn't find one specifically that I thought would be better than others, but I saw definite elements in some that I knew I would love. Last night when I started cooking, I started throwing things together and ended up with a masterpiece. It would be nice to have a picture of this masterpiece, but my camera is on its last leg and isn't taking very good pictures at all. You'll just have to trust me. In a large skillet (I used a 10 inch cast iron and it was on the smallish side), saute the leeks, onion and garlic in bacon grease until softened. Add 1 cup of chicken broth and simmer until completely soft. Meanwhile boil the potatoes, carrots, and celery in the remaining chicken broth until potatoes are cooked through, but not mush. Add salt and pepper to taste. *Puree the leak mixture and cream cheese adding a little broth from the potatoes if necessary to thin (I used my new food processor). Add the puree to the pot of potatoes and stir to thoroughly incorporate the puree. Heat through. If you desire a more blended soup, you can scoop out some of the chunks and run them through the food processor and return it back to the pot. Or, for a completely smooth soup, you can use a stick blender and blend the soup in the pot. I chose to blend some, but leave lots of chunks (I thought the pureed orange of the carrot might make the coloring of the soup unappetizing.). *I added the cream cheese to the main pot after incorporating the puree and it didn't melt completely. It tasted fine but had tiny white pieces throughout. I'm thinking that pureeing it along with the leeks will melt it completely and eliminate that. Last night we topped our soup with shredded co-jack cheese, but today I had it plain and it was equally yummy without it. I can imagine that adding crumbled bacon would also be nice. 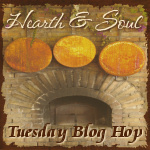 Link up at Penniless Parenting's Hearth and Soul Blog Hop. As a person who reads many food blogs, I find many things that are similar-less or no processed foods, more fruits and veggies (organic if possible), high quality meat-not conventional, etc. Another thing I read about frequently is soaking grains. The basic idea is that soaking the grain breaks down the proteins in it aiding in digestion. So, this week, I'm going to take a stab at that. I've got some steel cut oats that are looking for purpose. Also I think I'll try it with a loaf of bread and see how that turns out. It isn't a big secret that I like to save money. Sometimes I'm not very good at melding my desire to eat better food and still save money, but I'm working on it. Since I make our meals from scratch and cook three full meals and at least one or two snacks each day, it is safe to say that I spend A LOT of time in the kitchen (or near it). Back in the summer (week 26 to be exact) Hubby and I decided that we would purchase used if possible to save money and be "greener." To keep in the spirit of that "baby step," I've been periodically checking out Freecycle and Craigslist to see if anything fabulous popped up. Unfortunately most of the appliances that were listed weren't really things that I thought we needed and/or they were still pretty expensive. No big deal, I'd been getting along just fine without them anyway. After a lot of thought on why this was, I came to a conclusion. With Hubby working a second job for the past three months, there just isn't the support there at night. Not that he's not supportive, but there's alot to be said for adding a second set of hands to help with homework, run errands, keep Little Man busy, etc. while I'm in the kitchen. No extra hands mean I'm doing it all and I run out of steam long before my next day's meal prep gets done and there is no time for blogging or searching for new recipes during nap time because I'm doing laundry, sweeping floors, or trying to get dinner prep done before the kids come home from school needing help with homework, etc. OK, so now I identified the problem, but what could I do to solve it? I decided that adding a couple quality kitchen appliances to speed the prep process along would be money well spent. Coincidentally, I came across the Kohl's Black Friday ad and saw that they had a Cuisinart Food Processor at a crazy markdown. That, coupled with $50 that I had received as an early Christmas gift and a 15% off card, I paid a little less than $5 out of pocket for an awesome food processor. I've had it 5 days and I've already used every feature on it. I've used it to make biscuits (within 10 minutes of arriving home with it! LOL), waffles, shredded veggies on a salad and this morning I used it for cinnamon roll dough-delish! Hopefully, this new addition to my kitchen will save me time and help me be more efficient. I'm feeling a little less funk-ish. We've tried several new recipes in the past couple weeks, all of which the family thought were yummy. That's a plus. I'm back to planning and using cash, so hopefully that will keep the budget in check. I've made a few concessions though for my sanity. I have purchased a few convenience items (bag of fries and popcorn chicken and a couple take and bake pizzas). I know that these are certainly not healthy choices, but if I'm hitting McDonald's on a crazy night, it is certainly no healthier. We'll save these things for those on the go nights and save money by not eating out. One day, I hope to have all of this mastered with several homemade options in the freezer to just pop in the oven. But, until that day comes, I'm doing what I can. On the higher side, our school is working hard to make the lunches healthier. Salad bar is offered every day with a variety of fresh fruits and veggies. They make much of their bread items from scratch-adding whole wheat (not solely, but some is better than none). They serve bone-in chicken instead of processed patties. I appreciate the effort being made and if I could get them to ditch the canned goods, I'd probably be completely ok with it (but beggars can't be choosers it seems!). Now, the downside... I've heard that they might ditch some of the healthy measures they've taken because the general population of kids won't eat the healthier foods. Ugh! We'll see how that goes! I've rambled enough for now. Hopefully I can get a minute to post my menu plan for this week and include links for some of our new dishes. Have a great day! I like to think that my family eats a pretty wide variety of foods. I plan meals that use a variety of ingredients and from different cultures. You would think that by now, before I pat myself on the back, I should think again. Last Sunday I was walking through the produce section of our local grocery store and could point out at least 10 (and probably more) foods that I've never tried, much less prepared for a family meal. Ahhh, a new goal forming! We will try at least one new food each week for the rest of the year. Last weeks (if you didn't realize, I'm behind a week) new veggie was turnips. Hubby brought a few home from his second job and peeled them and ate them raw. Little Man and I didn't care for them, but Baby Girl loved them and wanted more. Big Girl was undecided-she ate the piece she was given, but didn't want more, so who knows on that one. I think in my next menu plan I will try to find a different preparation to see if a can win over the non-lovers (myself included). If you have a great recipe using either turnips or leeks, I'd love to hear it. Other possibilities for the rest of the year are spaghetti squash, acorn squash, various types of potatoes, parsnips and fruits like persimmons, papaya, etc. I don't necessarily know if the fruits are in season, but they have been on sale in this particular store lately, so I might try those as well. I'll try to keep everyone updated as to what we're trying and what the verdict is!